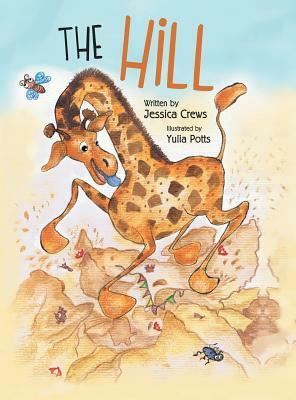 The Hill by Jessica Crews is a short children’s story about a mean giraffe, named Jermaine, who likes to pick on smaller ants, especially hard working Grant. Being bigger doesn’t mean you get to pick on others that aren’t as big and Jermaine must learn a hard lesson about being nice and being friends. ‘Again!’ was the first thing my son said after reading The Hill the first time. I read this book three times in a row to my 3-year old twins. Both my son and his sister were easily able to pick up on the underlying message of bullying and being nice. They both said, ‘that’s not nice’ and ‘he’s being naughty’ when Jermaine was picking on the smaller ants. They also described Jermaine as being in time-out at another point in the book. This book is beautifully illustrated in gorgeous detail. Both my twins spent time on each page pointing out little details to me – the ants, the ladders, the flags, and the other bugs. The illustrations masterfully correspond to the story and visually reinforce the message of the author. The author also included a short list of facts on giraffes and ants at the end of the book. The Hill is suitable for younger children as well as older children, especially those learning concepts of sharing, being nice, hurt feelings, and bullying. Parents can easily relate the message of the book to situations in their child’s life and help them relate it to Jermaine and Grant.